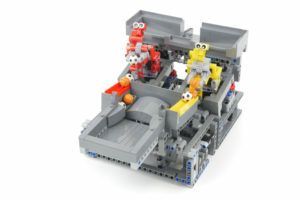 Two small hardworking robots that swing their arms and bag the balls are placed on a new great ball contraption (GBC) module. 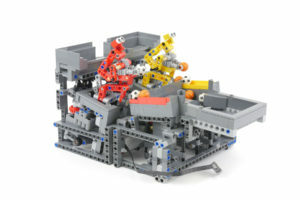 As soon as the robots catch the rolling balls in front of them, they quickly turn back and throw them away. They begin performing the motion of carrying the balls only when they find the balls in front of them. 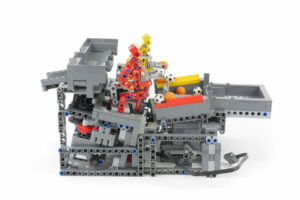 This implies that the ball-catching motion acts as a trigger for the ball-carrying motion. 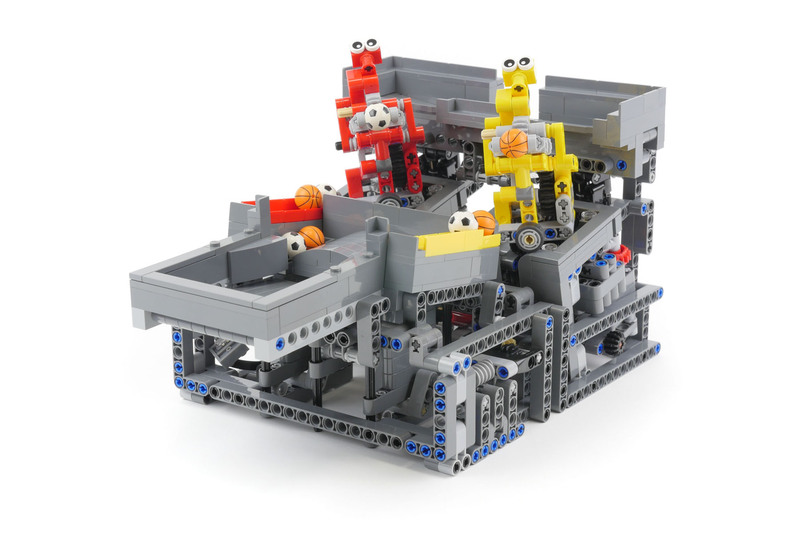 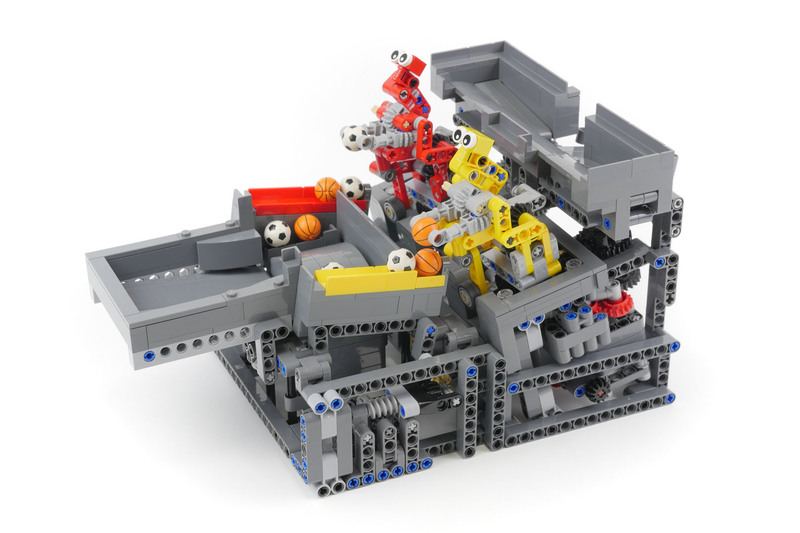 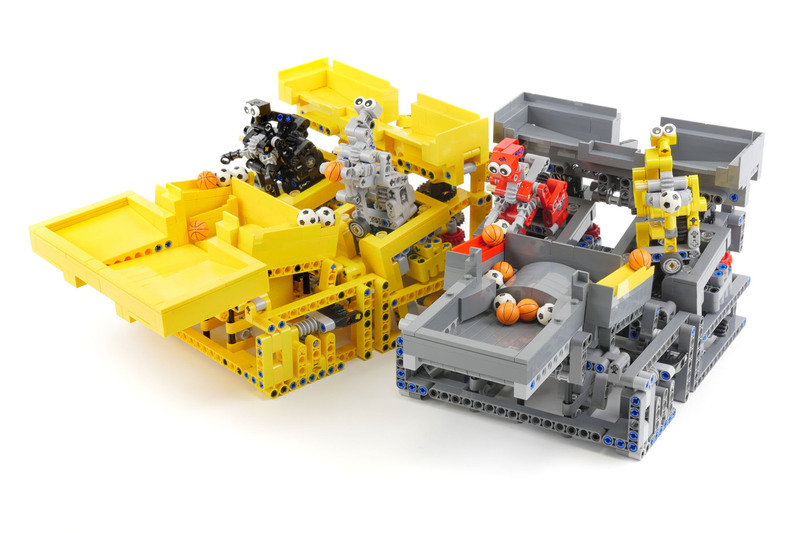 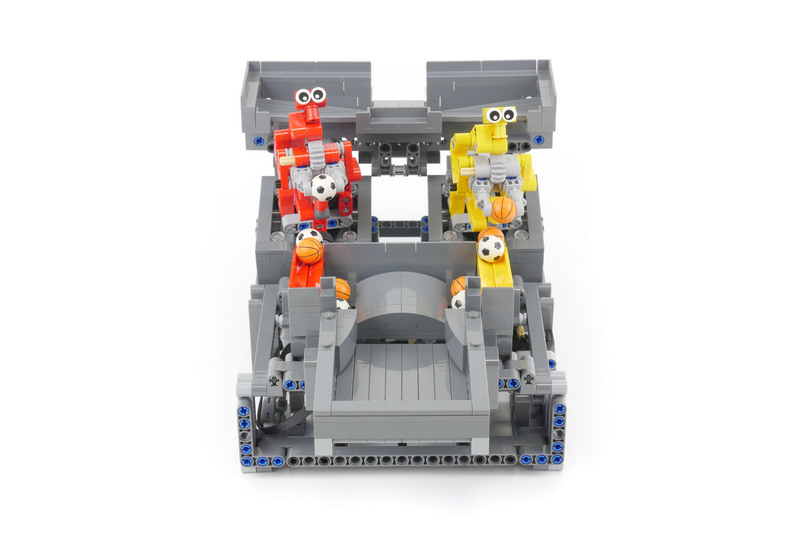 Two robots are necessary for the module to achieve a ball-carrying speed of more than 1 ball/second, which is the GBC standard. 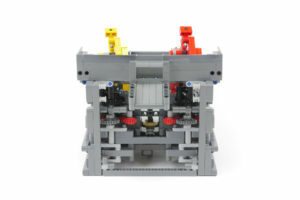 At the ball-supply part, the balls are separated into two lanes by a stair lifting up and down. 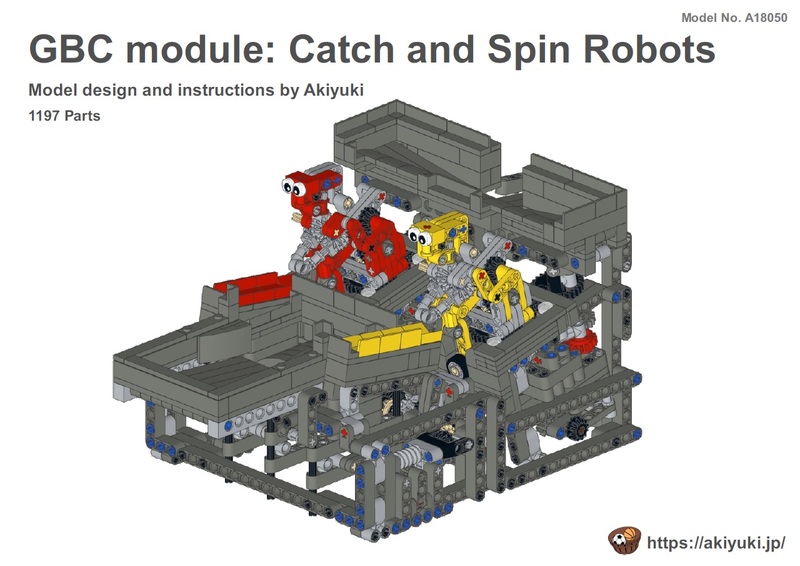 All the motions of the module are driven by only one motor, as usual. The mechanism of the module is complicated and delicate. 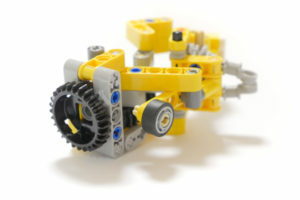 Troubles may arise due to the friction in the driving system. I have tried to improve the mechanism of the driving system in order to avoid any friction. I have reconstructed the driving system several times. In the new module, a turntable with 28 teeth is separated into an upper part and a lower part. 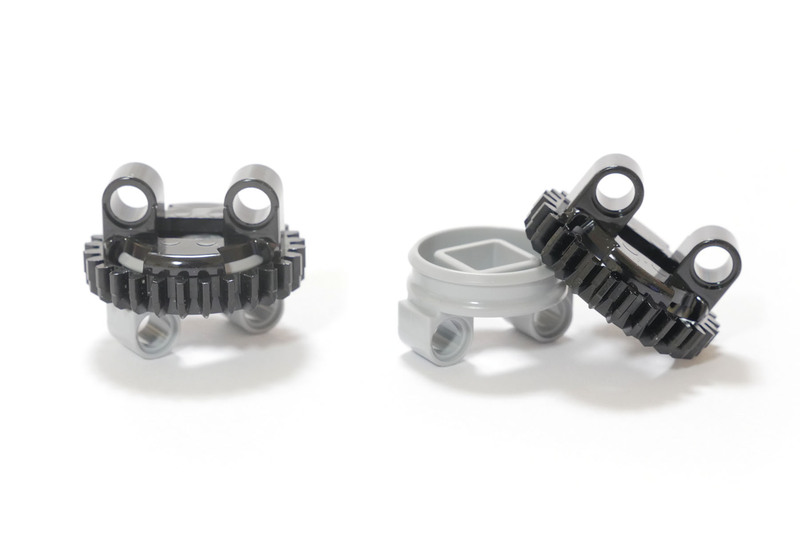 Only the upper black part with 28 teeth is used for the new module to prevent the troubles caused by friction at the turntable. 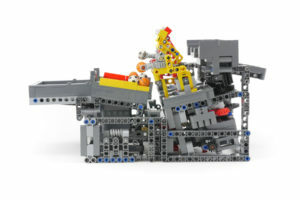 The earlier types of the module with non-separated turntables underwent troubles during their long-term operations owing to friction at the turntable. The power strength of the robot hands holding the balls affects the ball-carrying motion. Robots can be prevented from dropping the balls during the ball-carrying motion by varying the ball-holding power. 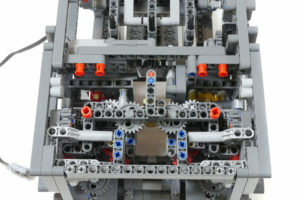 The ball-holding power can be adjusted using the two dials available in both sides of the module. 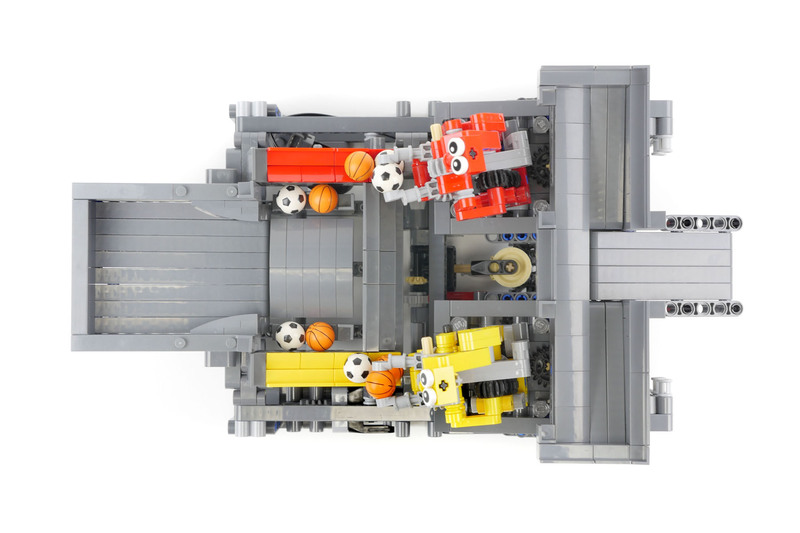 The ball-holding power needs to be adjusted after assembling the module for a smooth function. 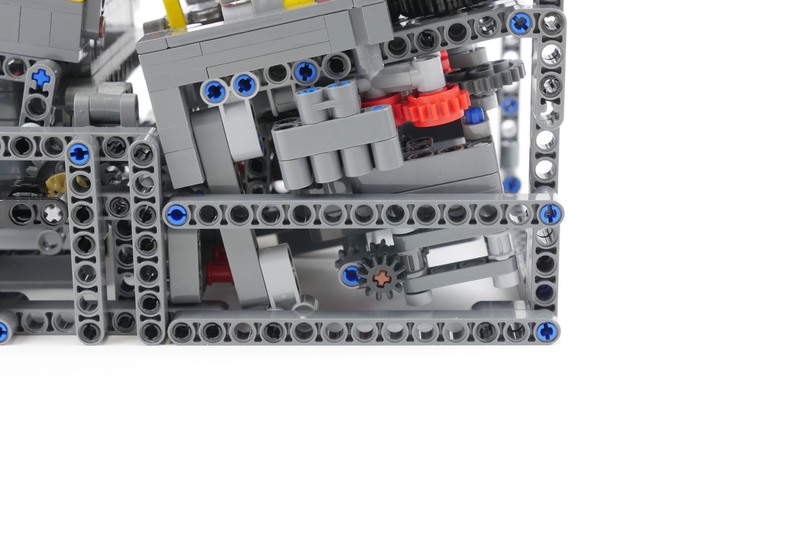 The frame of my GBC modules usually consist of Technic bricks. 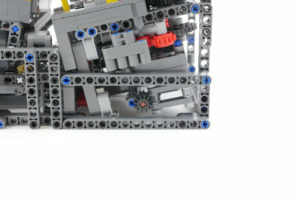 However, I constructed the frame of the new module using liftarm parts. 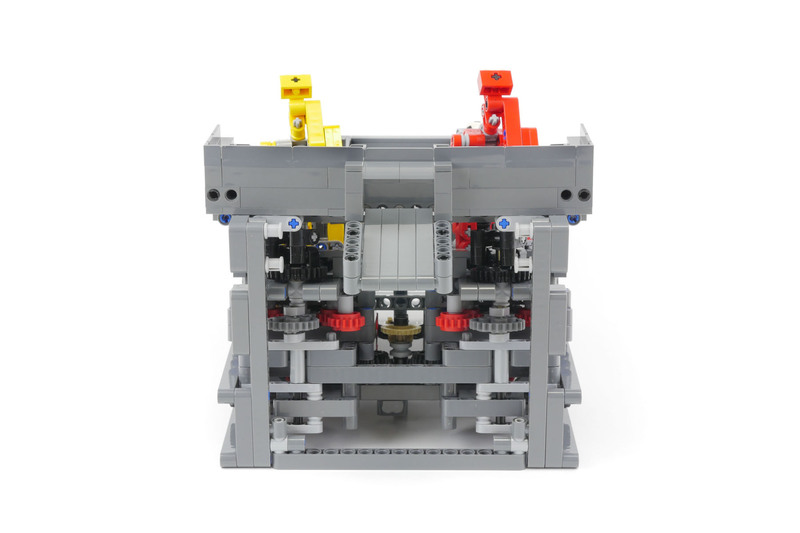 This frame structure possesses adequate strength for a smaller module. Instructions, the CAD data set, and part lists are available for this module; the instructions and CAD data set require payment, while part lists are free. 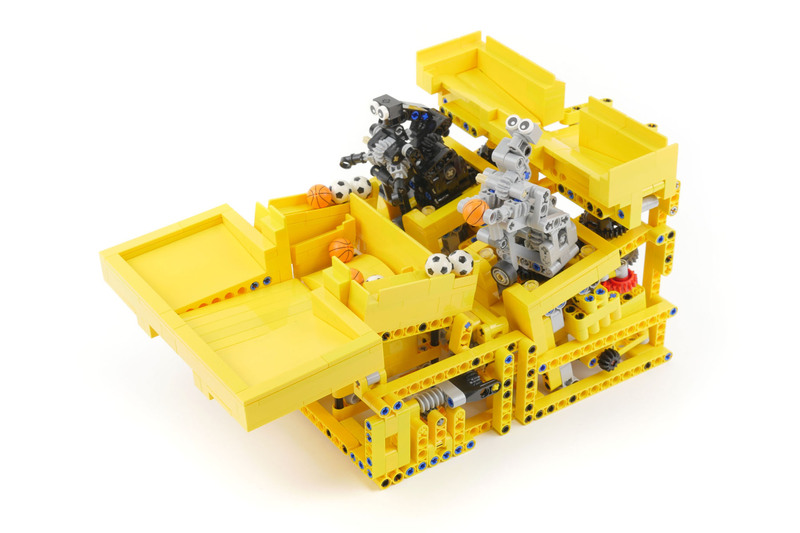 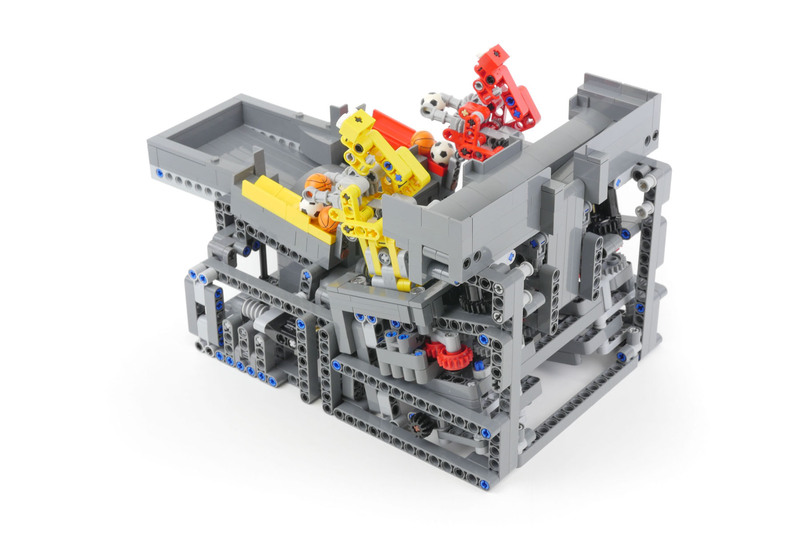 The instructions are intended for persons who have experience assembling Lego Technic. 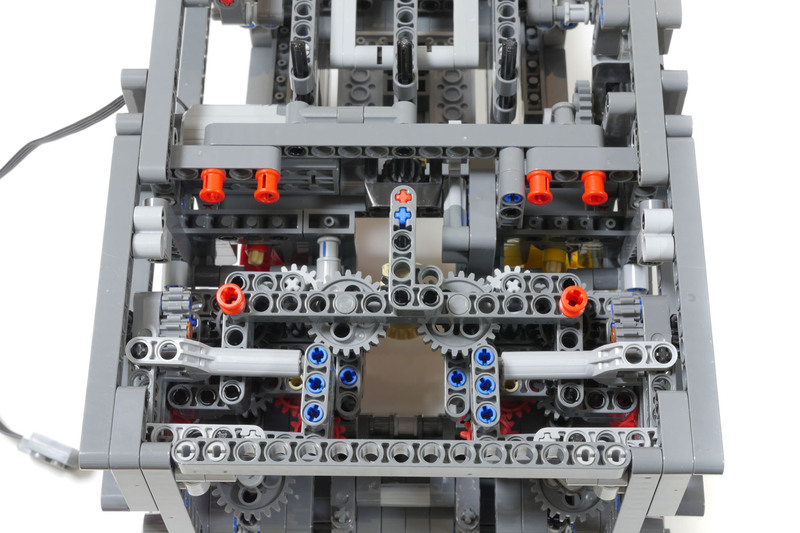 For a normal operation of the module, the phase measurements between the gears and the direction of the parts are important. 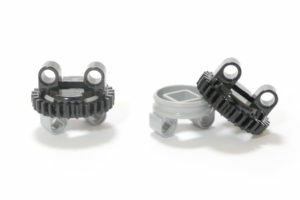 The methods for the phase adjustment are explained in the appendix of the instructions.